(877) 579-5097 Who Am I Calling? Use VA-LCP Curved Condylar Plates are used to repair fractures of the thighbone just above the knee. Complications The FDA has received more than 200 reports of complications, including the plates breaking. Failures Studies have found that the plates fail earlier and at “higher rates” than conventional plates. Harmed after a Curved Condylar Plate failure? The DePuy Synthes 4.5mm VA-LCP Curved Condylar Plate is intended to repair multiple fractures of the thighbone. Recent studies have shown a high failure rate requiring surgery to repair and replace the devices. The DePuy Synthes 4.5mm VA-LCP Curved Condylar Plate is a thighbone implant designed to repair fractures just above the knee, known as distal femur fractures. Synthes received the U.S. Food and Drug Administration’s 510(k) clearance to market the device in January 2009. The plate is part of the DePuy Synthes Periarticular Plating System. The device is made up of a plate and screws. A series of predrilled holes run the length of the plate. Doctors insert locking screws into the holes that align with pieces of broken bone to hold them in place while they heal. The long, metal plate is made from stainless steel and titanium alloy. It features a curved portion designed to fit around the lower end of the thighbone, where the femur flares out before joining the knee. The rounded “knuckle” at the end of a bone is called a condyle. The DePuy Synthes 4.5mm VA-LCP Curved Condylar Plate is what’s known as a locking compression plate. Locking compression plates have become an increasingly popular solution to repair a rare but difficult-to-treat fracture. Fractures of the thighbone just above the knee account for less than one in every 200 fractures. But because of the shape of the thighbone, repairing the damage is difficult and can lead to complications. Conventional plates utilize metal plates and screws to compress and hold broken pieces of bone together. Locking plates use screws that lock in place, making it more difficult for the screws to slip out. Locking compression plates, such as the DePuy Synthes 4.5mm VA-LCP Curved Condylar Plate, combine principles of both conventional and locking plate designs. A 2015 examination of medical literature published in Trauma International called locking plates “the greatest revolution in implant technology in recent times.” But the author also warned that “over-reliance” on the devices “has led to inappropriate” use of the plates. The most serious complication with the DePuy’s device is breakage. If the plate breaks, the patient will require revision surgery to remove and replace the device. Any surgery also involves a risk of infection. Doctors will attempt to treat infection with antibiotics if possible. If drugs are ineffective, a patient may require surgery to remove the infection. Between 2011 and January 2018, the FDA received more than 200 adverse event reports about the device, according to the agency’s Manufacturer and User Facility Device Experience database (MAUDE). Research suggests design flaws may be to blame. Attorneys are asking patients with broken or otherwise failed plates if they want help filing compensation lawsuits. Litigation involving this device could not be found in searches of courthouse databases. A study presented at the March 2017 Orthopaedic Research Society’s annual conference found the honeycomb pattern of between six and 22 holes for locking screws may contribute to the plates breaking. Researchers “consistently observed” failures between the eighth and ninth holes for the screws in longer versions. One solution was to fill the holes. But the researchers said the devices still failed at roughly the same rate. They blamed a “thin section of the plate near the outer edge” as a weak spot in the device’s design. The study was sponsored in part by DePuy Synthes. A January 2016 study in the Journal of Orthopaedic Trauma found “early mechanical failure” happened at a higher rate for devices like the Curved Condylar Plate than for traditional locking plates. The researchers cautioned against using the plates to repair certain types of fractures just above the knee that involve the femur’s growth plate. 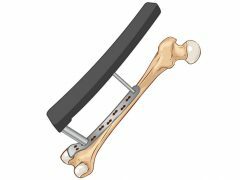 An earlier case review from 2006 published in the Journal of Bone and Joint Surgery looked at 46 patients implanted with locking compression plates similar to the DePuy Synthes devices. Six of those patients suffered plate failure and half of those failures were due to the plate breaking. “We propose that the [locking compression] condylar plate be used only when conventional fixed-angle implants cannot be placed,” the authors wrote. The 4.5mm VA-LCP Curved Condylar Plate has not been recalled. DePuy Synthes issued a voluntary recall related to similar devices in 2013. The company recalled 13 of its VA-LCP Curved Condylar Plates because a straight version of the plates had been improperly etched with a curved plate part number. The recall ended in August 2015.